A dome is the obvious choice in almost all circumstances, its just the cost that's the problem. 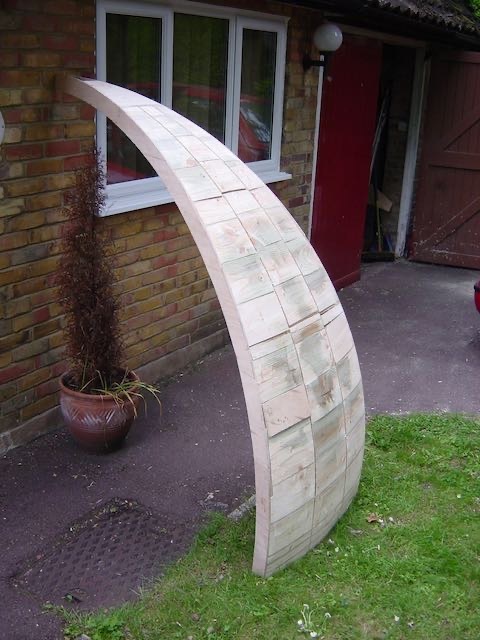 Even small (~2m) domes cost £1000s to buy ready made, and I needed a 3.2m one! Compared with roll-off roofs they occupy less space, are easier to open up, and offer good protection against winds and stray light. In my school days (40 years ago!) I had helped make a fibreglass dome, so I knew it could be done. By chance I found a fellow local amateur who also wanted a dome, and together we decided to make our own. Total cost was about £1000 for each dome plus about a hundred hours of DIY effort. First task for me was to make a "plug" out of wood that was a 1/12 of a complete dome. This required some careful shaping and sanding to get it both smooth and accurate. Meanwhile my friend went off on a one day fibre-glassing course run by the suppliers of the materials. Applying 4 layers of fibreglass and resin to the plug, we made a "mould”. Using the mould we cast 12 dome sections using 2 layers of fibre and resin. Each section took about 3 hours work for the two of us. Aesthetics were important and we both decided to have a dark green dome so that it would blend into our gardens. The colour is achieved by using a pigment in the first layer of resin that is spread into the mould. There was much relief when we did a quick check of the first few sections to see how well they fitted together. Each section had a 50mm flange moulded on up both edges and so assembly was a simple matter of applying some acrylic sealant and bolting the facing flanges to each other. To support the dome a 75mm by 75mm angle steel ring was rolled into the 3.2m circle (see the suppliers page). The dome sections were bolted to this ring, and the ring rotated on 8 heavy duty castor wheels, with 8 lighter wheels keeping it "on track". This works well, with just a small effort required to rotate the dome. The aperture was cut with a hacksaw and two curved aluminium u-section tracks bolted up each side. Two curved aluminium shutter sections were made, the lower hinges out, the upper rolls up and over to give a clear zenith view. The base for my observatory is an octagonal wooden structure. The floor is raised about 1m above ground level which keeps it all nice and dry. Steps lead up from the ground to the raised floor and the top of the base walls are then just 1m above the floor. The observer is therefore standing in the dome, rather than below the dome. This is very convenient for my large Newtonian scope. The telescope is mounted on a 1m high 50mm diameter concrete pier that is set in about 1000kg of concrete below ground level. Of course the pier is isolated from the building and floor. The building is wired to the house giving power, security alarm, telephone, & LAN access. On the north wall there is a small desk, a powerful pc and a radio controlled clock.